Except for laundry, the outside of the Ide’s apartment block in the temporary housing complex is colorless: gray gravel, black asphalt, beige aluminum siding. There is just one spot of green visible between here and the treetops on a distant hill: Mamoru Suzuki is bent over his bonsai, watering and pulling off dying leaves. Dozens of pots cascade off his steps and along the wall as far as his neighbor’s door. More of his plants line the far end of the building. Compared to his boisterous neighbors, Suzuki moves as quietly as a whisper. So shy we can barely hear him speak, he looks like he wishes he could vanish, or shrivel up like the brown leaf in his hand. After a few false starts, I ask about his plants and he proudly begins to explain. He tells us how he cares for the delicate tiny trees and shrubs, and discusses uses of the flowers and herbs. Bit by bit his story comes out. Like his neighbors, Suzuki was a farmer in Kawauchi. He is wiry and must be over 70 but moves like a younger man. He owned seven cows, he says, but he had to kill them all after the radiation came. For a time he lived here with his family of five, but they left to move further north, to Fukushima city. They tell him their new housing is much better up there, but he refuses to move a second time. Why? Because of the plants. Already he’s had to give up all his gardens once. He can’t bear to do it again. Since he could not take these new plants with him, he chooses to live here, alone, rather than uproot. Across the sea of asphalt stands another block of apartments. A man comes barefoot out of building H-15 and sits cross-legged on his front deck. He begins shaving there, and calls out to us as we pass by. Yukio Kubota is also from Kawauchi town. On March 15, 2011, four days after the earthquake, he and his wife evacuated to Niigata, his wife’s hometown on the west coast. She has stayed with relatives for the past year but he returned to Fukushima Prefecture to be closer to home. Once last summer he returned home for a few days. The weeds were more than a meter high, he says. “The first day we cut weeds. The second day we removed all soil in the garden up to 5 cm deep. The radiation inside the house was 4.3 μSv per hour, but we didn’t have a Geiger counter so we were sleeping in this place.” They left when they learned how high the radiation still was. A note on radiation dose: 1 Sievert is 1000 milliSieverts (mSv) is one million microSieverts (μSv). To compare, the peak level measured in this part of the Exclusion Zone (330 μSv/hr on 3/15/11) (1) was 76 times higher than the dose inside Yukio’s house; however his house level was still 12 times more than typical background radiation. The EPA recommends an annual dose limit of 1 mSv per year, which Yukio would reach inside his house in less than 10 days. Here is a useful chart that illustrates doses. Symptoms of Acute Radiation Sickness generally start above 350 mSv — 81,400 times the hourly dose at Yukio’s. This leads some Japanese to conclude there is nothing to worry about. However, just because you’re not keeling over today doesn’t mean there is no risk of future disease (as I discussed here). Now, a year later, government workers have finally decontaminated his house and yard. The initial new reading was 1 to 2 μSv per hour. “I am waiting to see the radiation levels before I decide to move home,” he says. 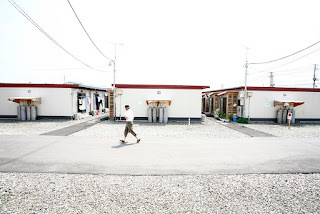 The Wakamiya evacuee housing complex in Koriyama city forms a giant grid of pre-fab buildings, 11 apartments per building, 5 buildings per row, erected on a field of gravel and asphalt. In the middle is the Odagaisama Center—a community building with a recreation room and a radio station that broadcasts news and music to evacuees. List of other radio stations for evacuees. 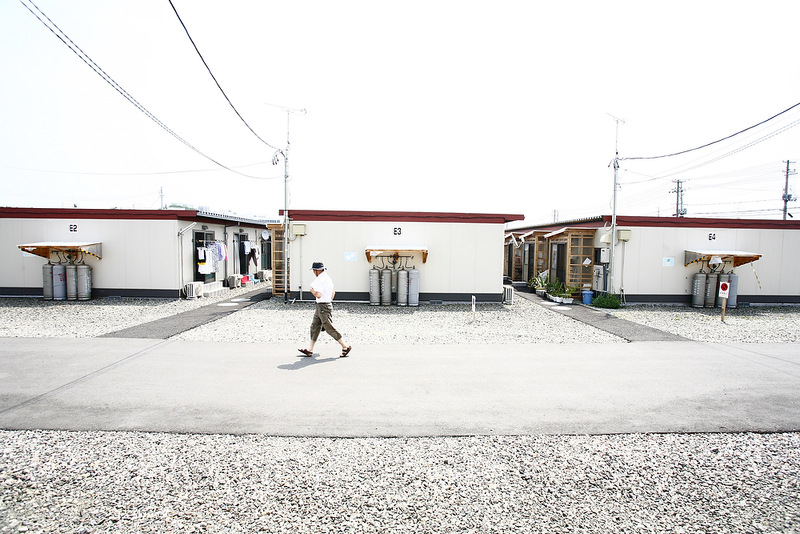 There is riotous laughter coming out of Block G-1, Unit 2, of the Wakamiya temporary evacuee housing complex in Koriyama. We hear it from the far end of the row. As we approach, a small round man and a woman come erupting out the door. As if the force of the laughter inside ejected them from the unit. They nearly barrel into a neighbor, and as they relate a story, he is soon laughing too. I smile politely and, still laughing, the couple introduce themselves. Takaaki and Yumiko Ide are evacuees from Kawauchi village. They are farmers, and one of the first things Takaaki tells us is how he misses the trees that surround their farm in the mountains near Namie. “And the vegetables, the vegetables,” his wife Yumiko breaks in. “Here we have to buy food, for the first time in our lives!” Beans, squash, rice and eggs, all from the store! The Ides have lived here for 14 months with their family. Initially, five of them crowded into one 10 by 20-foot unit, but as some other evacuees have left they’ve been able to spread out. Now their teenage daughter lives on one side, and their two mothers on the other. I ask if we could see what their apartment looks like and soon we’re all pulling off shoes and crowding into the small kitchen. The mothers, two little ladies, are sitting on stools behind a table covered with steaming dishes. A round of introductions and soon the laughter fills the room even more than the people. Each unit has a traditional tatami mat bedroom, a kitchenette and bathroom. Red Cross and government donations provided them with a refrigerator, 2-burner stove, microwave, toaster oven, washer and even a flat screen TV. It may feel small after their farm in the hills. But compared to third-world refugee camps (or a Tokyo apartment) it’s downright spacious. The family is about to eat dinner. Takaaki Ide, suddenly finding himself host to surprise visitors, both wants and does not want us to stay. We refuse but as we trade phone numbers we promise to return another day. Outside, the sun has set but the July heat still rises off the massive mall-sized parking lot in front of the Block G-1 apartments. Every parking space is painted neatly with a letter and number: evacuation planners intended for each family to bring exactly one car, but in fact most of the lot is empty. This complex built after the quake has 570 units, housing evacuees from Tomioka, Kawauchi and Futuba towns. All these towns are in the original 30-km exclusion zone, but in some places the radiation levels have fallen. Kawauchi residents have been allowed back in. Like many rural villages, Kawauchi’s population has been decreasing for a long time, down to 2,800 in 2010 from 3,800 in 1995. (1) Now about 400 of them have returned home full-time. (2) “The radiation level is down but there is no infrastructure and no jobs and no place to work,” one volunteer, Beverly Tajima, told me. Most afternoons, after the shift ends at his new job in Koriyama, Takaaki Ide drives back home to their farm. They were not permitted to bring their dog with them to the temporary housing, and so he returns home to feed her. After one summer, the weeds were taking over, he says. He cleared plants beside the house but worried about radiation in the yard and left the rest standing. One reason for his optimism is that he is certain they’ll be able to move home eventually, perhaps as soon as this fall. Japanese evacuees like those from Kawauchi have something the Ukrainians don’t: hope. Perhaps this is an aspect of national character—Buddhist equanimity versus Slavic pessimism. Or is it a function of timing? After two years, the future in Fukushima remains uncertain, but give the Japanese two decades and they may be more like the Ukrainians, resigned to their fate. 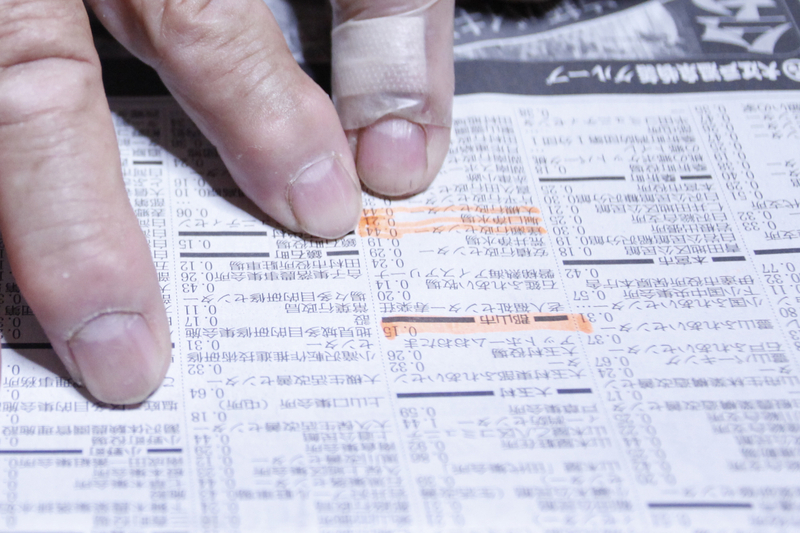 Every evening after dinner, plumber Masayuki Nagai opens the newspaper and pores over the radiation reports. The average daily dose for each city is monitored by government dosimeters and printed each day in the paper alongside the weather. Nagai tracks the changes, but at the same time, he doesn’t believe what he reads. “People don’t trust the government numbers,” he says. “Unlike the supermarkets, which now report exactly where each food came from.” People trust the stores labels, he believes, because a market would lose all its customers if they ever learned they’d been lied to. It’s harder to switch governments than supermarkets. OK folks, let’s review what happened in Fukushima. First there was an earthquake on an earthquake-prone island. Which caused a tsunami to hit the same country that invented the damned word. This then flooded a nuclear power plant that was built, as usual, beside the water. You didn’t see this coming? So came the hell and high water. After the Fukushima Daiichi disaster, there were three separate major Japanese investigations into what went wrong: reports from ICANPS, a government- appointed panel; NAIIC, an independent investigation commissioned by the National Diet of Japan, and RJIF, an independent think tank. (The National Diet, I should note, is not seafood — it is the name of the Japanese Parliament). Dozens of other organizations near and far issued their own analyses, including the TEPCO (Tokyo Electric Power Company) report, which neatly absolved itself of any wrongdoing. The Diet report calls the accident a manmade disaster, pointing out failures to “develop the most basic safety requirements” including risk assessment, preparing for collateral damage from a tsunami and developing evacuation plans. This happened due to collusion between government regulators and TEPCO, resulting in weak enforcement and slow implementation of regulations. TEPCO failed to have proper emergency training for personnel or adequate equipment inspections. In the emergency response, the roles between the Prime Minister, the nuclear regulators and the power company were unclear: all gave conflicting instructions and mistrusted each other. Here’s how bad it got inside the plant: as radiation levels soared, workers were trying to vent the reactors, getting contradictory orders and working by flashlight in the pitch dark. They discovered that their manuals assumed there would be no blackout during such an emergency and that “sections in the diagrams of the severe accident instruction manual were missing.” (3) It’s a miracle things did not get worse. Meanwhile, in nearby villages, an orderly evacuation was underway. No, actually, the evacuations were complete chaos. The Japanese government was slow to relay information to local officials and slower to admit how severe the disaster was. As a result, instructions for residents conflicted and changed every few hours. Residents were told to shelter-in-place or that evacuation was mandatory or that it was voluntary, and the evacuation zone kept changing, from 2 km to 3 km to 10 km to 20 km from the nuclear plant. As a result, some people had to re-evacuate four times while others were relocated to sites with higher radiation and left there. Approximately 146,500 people were evacuated but evacuees were seldom informed about radiation risks or safety precautions or what to bring with them. For the first four days, no one even knew the radiation levels in the surrounding villages. 23 out of 24 fixed radiation monitoring posts were washed away or disconnected by the tsunami. And the one functioning mobile monitor was not mobile: the truck was out of gas. What I saw is that many evacuees are living in a state of limbo, still living in temporary housing, waiting to learn if they’ll be able to return home, waiting for more answers that never seem to come. (1) Why Fukushima Was Preventable by James M. Acton and Mark Hibbs, Carnegie Endowment for International Peace. (2) Kiyoshi Kurokawa in the Executive summary of the official report of The Fukushima Nuclear Accident Independent Investigation Commission. (3) The official report of The Fukushima Nuclear Accident Independent Investigation Commission. In the months after the 1986 accident, machinery driven by liquidators often became too radioactive to continue using. So they just dug pits and buried their own radioactive vehicles. Today, workers unearth the machinery to lay foundations for new construction. This day’s discovery was the boom of a crane. 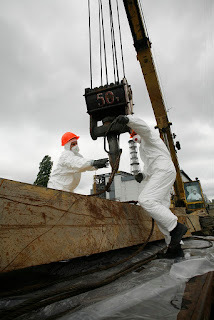 They lay it on a flatbed truck (covered with plastic to hopefully contain some of the contamination) and haul it to an edge of the Chernobyl plant site for pressure washing. (The contaminated washwater gets piped to the liquid radioactive waste treatment facility). Then the boom gets trucked to a dumpsite in the Exclusion Zone, where it will be stored until after you and I are dead. Unless priorities change once the danger fades from some bureaucrat’s mind. Or unless it gets stolen first and sold for scrap. The horse is out? Quick, close the door! It seems to me there must be a better way, but our attention is short and disaster mitigation is long. After the Chernobyl accident, with no prior plan for disposing of radioactive waste, much debris beside the plant was simply dumped back into the ruins of the reactor 4 building. The “Shelter” (AKA the Sarcophagus) with outer concrete walls and iron shell was then built over the destroyed reactor 4. Constructed hastily with little planning in extreme conditions, it is neither stable nor leak-proof. It was meant to last 20 years but started crumbling sooner. As a result, a modern radiation enclosure is now under construction. It will cost $2 billion to build, an expense borne by 40 countries and the EBRD (European Bank for Reconstruction and Development). From 2008 to 2012, workers did groundwork for this New Safe Confinement super-structure. And guess what they found underground? Contaminated bulldozers. Excavators. Dump trucks. All buried in the field just west of the destroyed reactor. Elsewhere in the Zone, liquidators buried everything from topsoil to village houses. Now at least 800 burial sites, mostly unmarked, are slowly leaching radiation into the groundwater. (3) (Fukushima now faces similar problems, which I’ll discuss later). Other decisions made in Chernobyl’s heat of the moment — exactly where to evacuate, and how to structure survivor benefits — have become politically and economically intractable problems for Ukraine. Once these plans are set they are hard to revoke. Ukraine spends 5 to 7% of it’s annual budget on Chernobyl survivors (2) but at the same time, the stipends each individual receives are so small as to be unhelpful. “Every month, the government buys me one bottle of vodka,” one liquidator told me. I’ve heard people ponder how life in Ukraine would be different had the disaster never occurred. But accidents happen. The seas rise. An equally valuable question: what if the disaster happened but it was really well managed? Tomorrow: What went wrong in Fukushima? 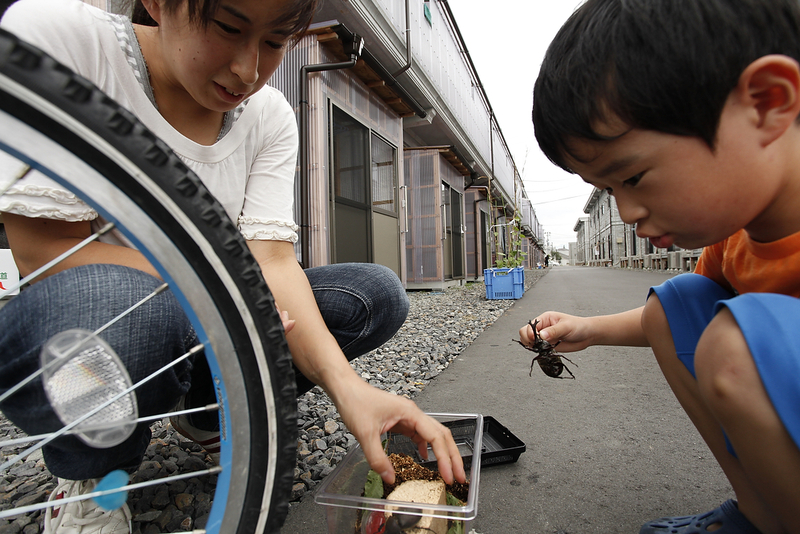 Fumiya Sekine, age 6, and his mom Kaori Sekine play with his new pets — a pair of stag beetles. The Sekine family evacuated from their home in Kawauchi village, 20 miles west of the Fukushima Daiichi nuclear power plant, due to high radiation levels in the village. They have lived in a one-room “temporary housing center” apartment in Koriyama city since the complex opened in June 2011. They have no idea how long they’ll stay here. Got a crisis on your hands? Maybe your roof is leaking after a heavy snow. Maybe there’s a mile-wide tornado roaring towards your town. Or maybe, like Kaori Sekine and her family, your village is suddenly radioactive. Whatever your crisis, experts in disaster management speak about four stages of managing it. These are: (1) mitigation, (2) preparation, (3) response and (4) recovery. Mitigation is all about reducing risk — anticipating the worst that can happen and figuring out what we can do to make it merely bad. The preparation stage involves emergency planning and practice, so that everyone is ready when the disaster hits. Response, well, I’m not going to break that down for you: it’s putting your emergency plan into action. And recovery is the long slow road back to normal — or finding a new norm if your old life is forever gone. Mitigation, preparation, response and recovery. In other words, by the time you see the tornado coming, the experts are already on to stage 3. The rest of us are two steps behind them. Maybe you meant to repair the roof last fall but never got to it. Maybe you wanted to dig tornado shelters but got stymied by red clay and red tape in a red state. Sorry about that, Oklahoma. When you’re standing in the nuclear plant control room with wet feet, it’s too late to build a higher seawall. The fact is, preparing well for every possible disaster is expensive. Who wants to spend their hard-earned cash building a 50 foot seawall if 19 feet has always been sufficient? Who wants to spend money on a new roof if you can just patch the old one? Until, in hindsight, it seems completely necessary and stupid to not have done it right. There’s always a balance between our assessment of risk and the cost of preparation. 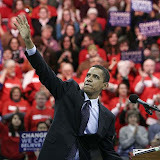 The lack of political will to prepare fully means we just wait for a calamity to strike. Then, once the children are dead but before they are buried, our priorities suddenly shift. Our pattern of responding to disasters is so consistent that it’s completely predictable. By next year, I expect, more schools in Oklahoma will have tornado shelters and schools in Connecticut will have door code security. For a few years, the Boston Marathon will have more police protection and factories in Dhaka will have better enforcement of building codes. Every district in Fukushima Prefecture is now having emergency drills. If disaster strikes a second time we’ll be more prepared. But then, if nothing goes wrong for a decade, we’ll let things slide again. If you went to an American public school between 1960 and 1990, chances are it had a fallout shelter. You may remember the sign, probably posted by the back door where the smokers hung out. But I bet you were never down there. Built during the Cold War, these basements were equipped to protect schoolkids from those Russian missiles that never came. If we had a Fukushima in the U.S. today, we’d find most of those fallout shelters unusable. The one in my high school, I heard, got filled with jazz band instruments and art supplies. In Moore and Sandy Hook and Far Rockaway and Boston and even in Fukushima, the recovery will peter out and then so will the preparations for next time. Some will still carry wounds but the rest of us will forget. 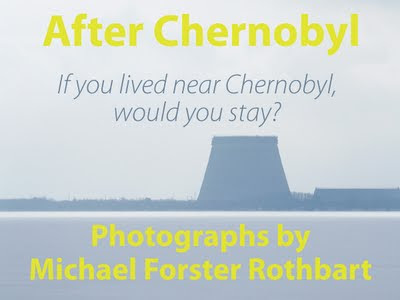 This is the blog archive for Michael Forster Rothbart Photography: photos, experiments, news + comments about how photos were made. Updates averaged twice a month. For more current work find me on Facebook and Instagram. Nature Photography workshop, Cooperstown, NY. NPPA Multimedia Immersion, Syracuse, NY. Phootcamp! In the woods near Woodstock, NY. Who has time to keep this updated? Not me! 2012 exhibits in Brattleboro, VT and Woodstock, NY. June 2010 - Oct 2011: Traveling exhibit in 5 Wisconsin libraries. After Chernobyl exhibit, UW Hospital, Madison, WI. Life of the Mind exhibit, Project Space Gallery, Oneonta, NY. SUNY Faculty Exhibit, Martin-Muller Gallery, Oneonta, NY. Jan 22. 2010: Rochester Contemporary Art Center. 7 pm. Feb. 21. 2010: Montshire Museum, Norwich VT. 7 pm. April 1, 2010: Palm Springs Art Museum, Palm Springs, CA. 9 pm. April 26, 2010: Embassy of Ukraine, Washington DC. 11 am. July 1, 2010: Mau Mau Underground. Fontrodona, 35, Barcelona. 8:30 pm. July 17, 2010: Center for Photography at Woodstock, NY. I'm interested in the social consequences of environmental issues. Since 2007 I've photographed and interviewed people who still live in Chernobyl. There is a war brewing in the hills of central Pennsylvania, between those who want to drill for natural gas and those who thinking fracking will destroy their hometowns. The floods of 2011 destroyed communities across upstate New York. I am photographing in 6 towns as people try to rebuild. In my commercial work, I photograph for colleges, universities and museums, helping them tell their stories to prospective students, alumni and visitors.